A Zimbabwe cargo plane crashed as it took off from Shanghai's main airport Saturday, killing three American crew members and injuring four other employees after it veered off the runway and burst into flames. Three Americans on the seven-member crew died and a fourth American was injured, U.S. Embassy spokesman Richard Buangan told The Associated Press. He did not know the injured person's condition. The TV report said the other crew were from Indonesia, Belgium and Zimbabwe. The aircraft's tail struck the ground on takeoff, China Central Television reported. Footage showed black smoke billowing from the wreckage. 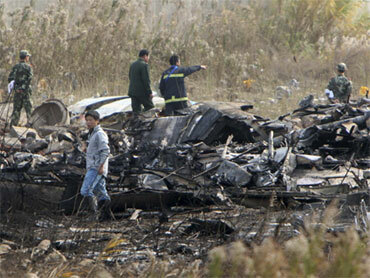 The crash occurred just after 8 a.m. (0000 GMT), the official Xinhua News Agency said. The plane was headed to Bishkek, capital of Kyrgyzstan. The aircraft was operated by Zimbabwe-based Avient Aviation, Xinhua said. Calls to the Zimbabwe Embassy in Beijing went unanswered Saturday. More than 30 international flights were delayed Saturday morning, leaving about 4,000 travelers stranded on planes or in airport lounges, Xinhua said. CCTV said two runways at the airport were shut down. Shanghai is China's largest city and its economic capital. The Pudong airport is located on the eastern edge of the city, by the East China Sea. Recent crashes in China include two Chinese air force jets colliding in June 2008 in Inner Mongolia, with both pilots parachuting to safety. In June 2006, a Chinese military plane crashed in eastern Anhui province, killing all 40 people aboard. By Associated Press Writer Eugene Hoshiko; AP writer Cara Anna in Beijing contributed to this report.